All opinions in are- JYG bowling night on Friday was a blast! Thanks for coming out to join us, JYG! What better way to celebrate summer than spending a Friday evening with friends? We're so glad you could spare the time! We named our bowling team Lightning, because we got so many strikes. We bowled, we laughed, we ate too much pizza. The team had so much fun, we decided we'd never split! We started our night of bowling off with pizza and "trick shots", which included everything from granny bowling to throwing the ball between our legs to bowling with our eyes closed. Alisha was by far the best at closed-eyed bowling! Our sponsor, Bre, won our second game with a career high score of 76! Woot woot! 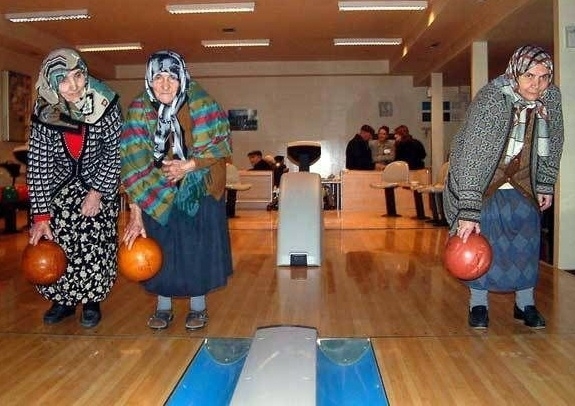 I was going to end this blog post with a bowling pun, but I'll spare you. See you at the next JYG event!